Over the past week I’ve had the opportunity to review this pair of dodocool Bluetooth Headphones Sports Earbuds. These headphones feature Bluetooth 4.1, NFC, noise cancellation, Adopt aptX HD audio encoding, all while being sweat resistant. During my use, I paired it with an iPhone 6S Plus, so I wasn’t able to test the NFC functionality due to limitations of the iPhone. 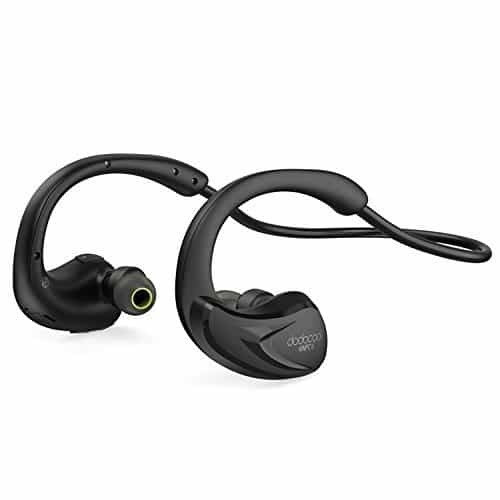 It also features multipoint technology which allows you to connect the headphones to two bluetooth devices simultaneously. During my review, I used the dodocool Bluetooth Headphones Sports Earbuds while commuting on a train and walking in downtown Chicago, where there is plenty of background noise for testing. The headphones come with 3 different earbud sizes and it is important to select the right size to get the best sound quality. When I used the mid-sized earbuds, the sound was tinny and I could still hear background noise. When I tried the larger size earbuds, they created a suction in my ears which improved noise cancellation and improved the sound quality. Selecting the right size earbuds also helps the headphones stay in your ear while walking or running. I didn’t have any issues with the earbuds coming lose during a workout. While testing the call features, calls sounded clear and the person on the other end was able to hear me clear. If there is a lot of background noise or wind, the other person would hear some feedback. The microphone is on the bottom of the right earbud, so there is some distance between the mic and your mouth. Since these are sports earbuds, I don’t expect to use them for phone calls during a workout. The dodocool Bluetooth Headphones Sports Earbuds are rated as having 10 hours of playback time or 180 hours of standby time. While I didn’t use the headphones for a full 10 hours, their rating seemed accurate. The headphones will also display the battery meter on an iPhone with iOS 10 or higher and they come with a standard micro-USB charging cable. The headphones are sweat resistant rated IPX Level 4. I had moderate sweat during my workout, but I didn’t try to soak the headphones. The build quality seems good, so I think they’ll withstand sweat and water. There are only a couple of improvements I would recommend to the manufacturer. While I like the band design where the headphones automatically roll up for storage, it can be a little awkward to unroll to wear them. You have to twist your wrists to unroll them, when you have to hold onto each earbud while putting the headphones on, otherwise the band will roll back up into the storage position. The other improvement I would offer is to have a separate on/off button and call button. The current design uses a multi-function button which is used to turn the device on and off, answer or hang up a call, and pair the device. Having separate buttons would allow the call button to also be used for voice recognition like Siri-integration for example. For under $20, you can’t really go wrong with these headphones. They offer decent sound for workouts and have a comfortable fit in the ears. To purchase these headphones, visit Amazon.